The one personal development skill that I observe is making a huge difference in people’s successes is the ability to plan ahead. Writing your own personal development plan is exactly the process that, if done right, can give you this advantage in life. Because a well laid personal development plan will give you a strong direction in life. On the other hand it will be in perfect harmony with who you really are. 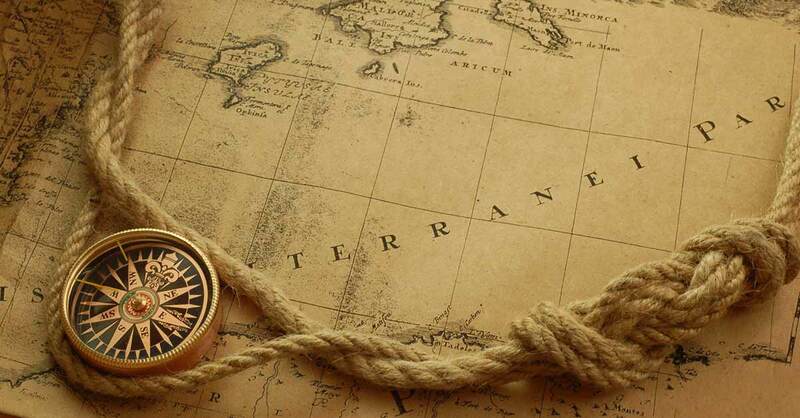 This is something done wrong very often, but what good is it for to have a great plan that is taking you to a wrong destination? So the key is to create a personal development plan not for the sake of just having it, but to have a plan that is perfectly mirroring your own individual wants and needs (see also “What is Personal Development?“). The idea is that you are actively starting to give concrete thoughts to why you are here on this earth, what your purpose is and what steps will help you to fulfill it. What Makes a Great Personal Development Plan? A good personal development plan is first and foremost purpose-driven. That’s why it is in perfect harmony with the core of your being. It aims to give you personal fulfillment and helps you to grow. In simple words: What you plan is what you REALLY want. That is key, of course. Otherwise you would deceive yourself and plan for something that is not really in alignment with yourself. That sounds trivial, but sometimes when you get an external push to do personal development planning, you may do it, but stay essentially disconnected from your true desires. How is it different from your personal development goals? Goal setting is an important part of a personal development plan, but not the whole picture. I like to look at it like goal setting being a technique or a process to define exact goals, while planning is similar to developing a vision and giving your life a general direction. Planning is like laying a strategy, goal setting is like creating the tactics to fulfill the strategy. Planning comes first, goal setting second. Your individual personal development plan must be rooted in your own values. And it has to take your personal strength and weaknesses into account. List 5 of the most important values in your life. Popular examples are: Integrity, Family, Wealth, Success, Love, Faith, Creativity, Adventure, Freedom, Power etc. Then put them into a priority by asking yourself, which value is more important than the other, so you have a TOP 5 in the end. Now think about your personal strengths. Popular Examples are: self-confidence, empathy, analytical, creative, action-oriented, energetic, people-oriented, communicator, business-oriented, family-oriented etc. It is a nice exercise to get clarity about your values and strengths and weaknesses. This knowledge will guide you to develop the right personal development plan for you. So when you write your plan, think about how those goals are in harmony with your top values and if they align with your personal strength and avoid your weaknesses more or less. You don’t necessarily need those 7 in your life. Think about the areas that are most important for you, where you want to develop, and then define them for you (in writing). I wouldn’t suggest to use not more than 7, maybe less if you can. Stay below 10 for sure. You can also vary those areas if you want to create a personal development plan that is focussed on some special area, maybe your eduction or your job development. But keep in mind that you need overall balance in your life even when you focus on just one specific part at the moment. How to Create Your Personal Development Plan? To create the perfect personal development that is unique to you, take your life areas and set one personal development goal in each life area. Don’t go overboard, it’s always best to stay simple and focused to get the results eventually. You can do more than one goal per life area of course, especially if you really feel that you want those, but my suggestion is to keep life simple. Take your time and really put some thought into it. This is the perfect time to use my Guide to set compelling personal goals: Goal Setting: 7 Steps to Set Your Life Goals. Along with your goal you will develop an Action-Plan and set a Deadline. 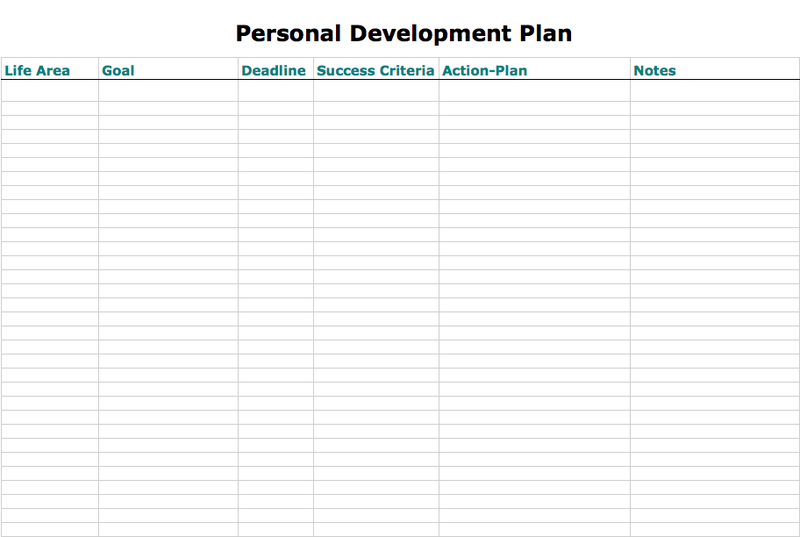 → Download the personal development template as a PDF, or here as an Excel file. Now start entering your individual figures. Good luck with your personal development plan and I hope you will reach all your goals with it! If you have comments or questions, please let me know below! I noticed that the “Spirit” part of your development plan it only lists things that might apply to new age, aesthetic, or eastern individuals. However, many of us believe in God and have a belief system and that is a very integral component of Spirituality. It would be a good idea if you would broaden your definition of Spirituality so that you 1) don’t offend anyone 2) you don’t discriminate against various forms of spirituality 3) don’t come across as someone who is ignorant or purposefully avoiding God in the context of Spirituality. Admittedly, this almost turned me off to your thoughts, however, I am going to give you the benefit of the doubt. Thanks for the note, although it’s a bit promotive for a first comment ;-) Looks like a good app for planning, though.